The Keynote Session took place yesterday, Monday, March 25th from 3:30 p.m. to 4:30 p.m. in the Davidson Ballroom. NACE CEO Bob Chalker and NACE Director– Strategic Planning Dan Adley (CEO of KTA-Tator, Inc.) shared the role in introducing the speaker, bestselling author and renowned futurist Jack Uldrich. Chalker outlined the theme of the session, including an overall view of the past, present, and future of the corrosion industry and how NACE members can and have contributed to that progression. Adley focused the topic even further by challenging the audience members to see how they can personally prepare for and influence the industry. Two videos preceded Uldrich’s talk, covering information on NACE’s annual Legislative Day in Washington, D.C. (June 5–6 this year) as well as an overall video on several of NACE’s membership offerings. Samples of future technologies were available in the hallway outside of the ballroom, including a training device from the International Union of Painters and Allied Trades (IUPAT). The highlight of the keynote was Uldrich’s talk titled, “Corrosion’s Crystal Ball:The future will arrive sooner than you think.” He shared specific points on what he referred to as “AHAs,” pointing out ways to hone in on Awareness,Humility, and Action. The presentation included various video clips, which Uldrich used to support his points on technology trends, such as 3D printing, the internet of things, and artificial intelligence. 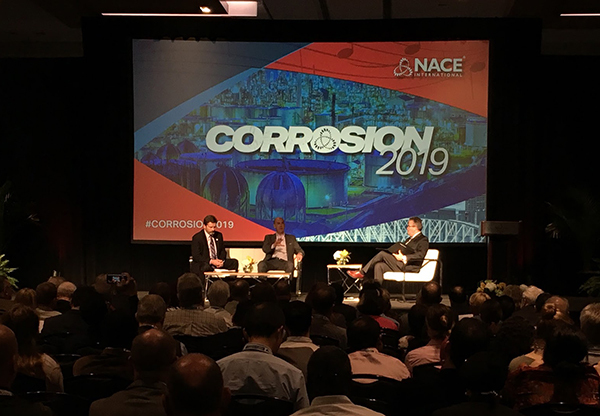 The event culminated with a question-and-answer period where Chalker and Adley helped to connect Uldrich’s points to the corrosion industry and NACE members specifically. The author summed up the entire talk with the idea that rather than answering the wrong questions, the industry should look to start asking better ones.